My sartorial choices have been a little bland recently. This fashion funk happens to me every March, the weird transeasonal period between winter and spring never gives me much motivation to dig around my wardrobe for something cute to wear. Nature is starting to bloom, but the sunshine is still deceptive – I’ve skipped out of my house sans jacket and instantly regretted it one too many times to trust what I see out of the window! Shedding heavy layers while still wearing enough not to catch a chill when the sun goes down is a fine art indeed. That’s why I prefer to keep things simple at this time of the year, sticking to basic wardrobe pieces which can be easily thrown on instead of trying to put together a “look”. Truth be told, I love the low maintenance nature of a look made up of basics, no need to plan or fling clothes around the room while trying things on. It’s for this reason that I invest in basic pieces, I feel like a LNA or Alexander Wang t-shirt just hangs a little nicer than a tee from H&M or Topshop. 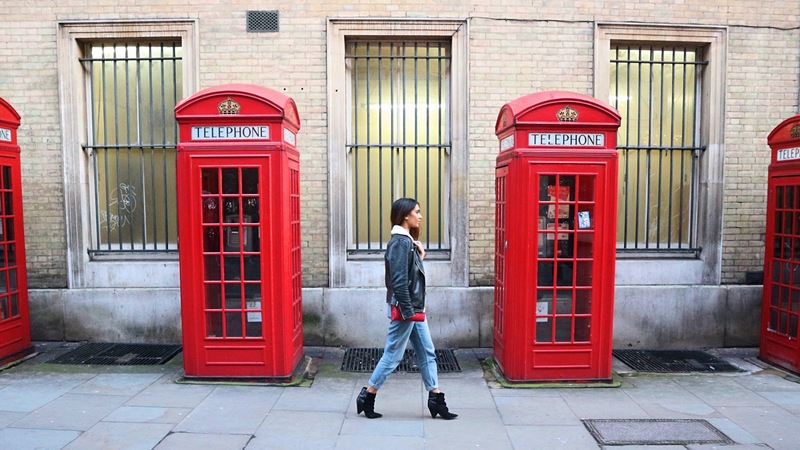 Jeans are the ultimate wardrobe staple and, in a slight contradiction to my previous paragraph, I’m a Topshop devotee when it comes to denim. Their collection is spot on and their fit is perfect, on par with designer pairs but naturally for a fraction of the price. Topshop make seasonal denim pieces, like my cutout detail boyfriend jeans, a cute way to elevate your jeans without a huge investment. 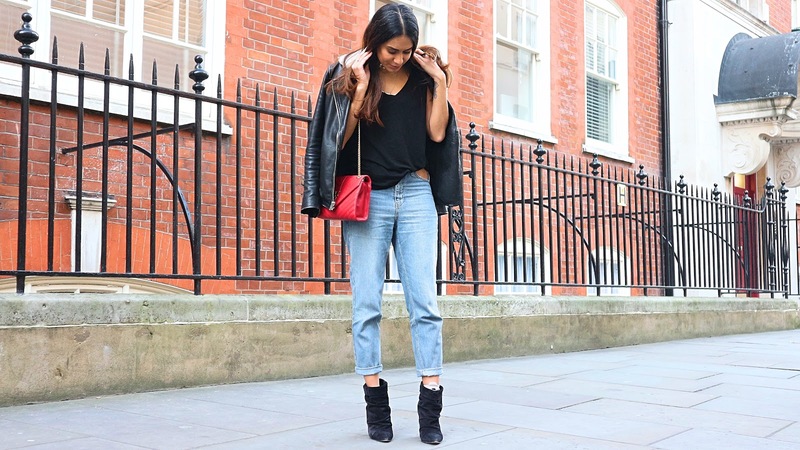 I paired my jeans with a plain black tee from LNA, one of my favourite t-shirt brands. The boots are Isabel Marant, I love the triangular heel which makes my overall look a little more effortless. I slung on this beautiful Levi’s Made & Crafted leather jacket, which is a lot heavier than it looks.The heavy leather combined with the sheepskin collar make it the perfect jacket to keep me toasty in the unpredictable spring weather. 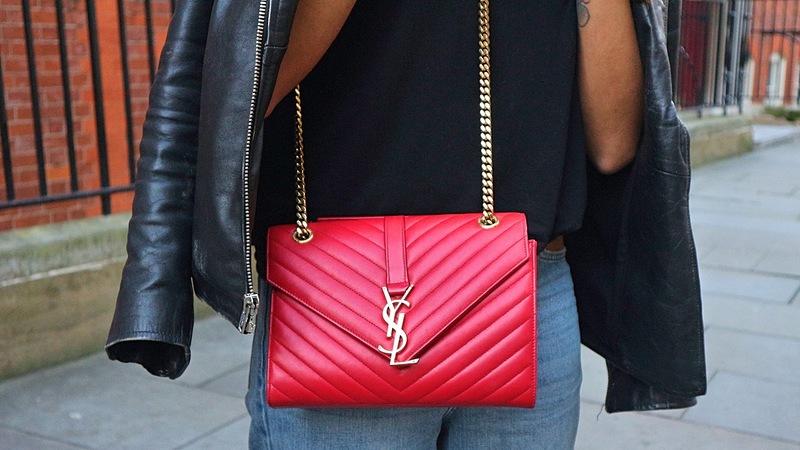 My cheery cherry red Saint Laurent satchel adds a much needed pop of colour to my look.